The joy of cooking is when you try new things every day! Insanely juicy, tender baked Sirloin, served with apricot sauce is an exotic go-to supper dish. 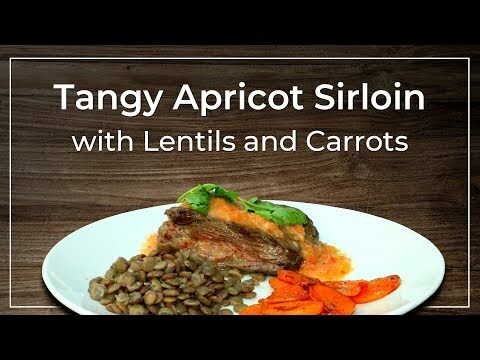 Fresh Apricot Sirloin with Lentils and Carrots for dinner? couldn’t get anything better than this. The sirloin is complemented by sweet and pungent Apricot that augments the flavor and makes the most amazing yet healthy appetite. The fruity saucy taste on the baked steaks with some carrots, white rice or even lentils toppings is a winner. You are free to use the substitute like peach or pineapple as well but my preference is apricot, as it has vitamins and fiber & also helps to reduce body fats. So the focus on fitness and happy taste buds together get served in this platter. 2 sirloin steaks of 4 oz. Chop the bay leaves, basil, and tomatoes. Bone apricots and cut them into small squares. In a food processor, blend the tomatoes, apricots, basil, bay leaves, marjoram, garlic powder, lime juice, and lemon juice until smooth. Season with sea salt and pepper to taste. Put the apricot mixture into a saucepan and add ½ cup of water. Heat until mixture has a sauce consistency. Stir constantly. Grease a baking pan with coconut oil and place the sirloin steaks and carrot slices onto the prepared baking pan. Serve steaks with lentils and carrot chips. Pour apricot sauce over the steaks. You can substitute the lentils with white rice. Wash the vegetables before using them. Peel the carrot before slicing it. Depending on how thick you sliced the carrot, beware for them not to burn in the oven. Check if they are ready 10 minutes after placing them in the oven. If they are golden, remove them from the oven and place the steaks back to the oven. Seep the flavors; enjoy the incredible juicy Sirloin with tangy Apricot for your Dinner. You would even lick the plate because there’s too much of intensified flavor that wouldn’t let you stop. If you really want to impress your family or someone special with your home cooking skills, We Being Fit says go for it! A platter of healthy delicious flavors that just looks soothing and taste heavenly.